If a monster(s) is Normal or Special Summoned to a zone(s) this card points to while you control no cards in your Spell & Trap Zone: You can destroy 2 cards in either player's Spell & Trap Zones, also you cannot activate nor Set Spell/Trap Cards for the rest of this turn. 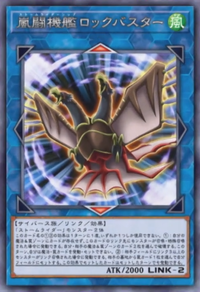 If a Link-3 or higher Link Monster is Link Summoned to your opponent's field: You can Set 1 Trap from your opponent's GY to your field. It can be activated this turn. You can only use 1 "Stormridership Rockbuster" effect per turn, and only once that turn.